Mark Baugh-Sasaki's sculptures and immersive installations at Krowswork are in places surreal and unsettling. 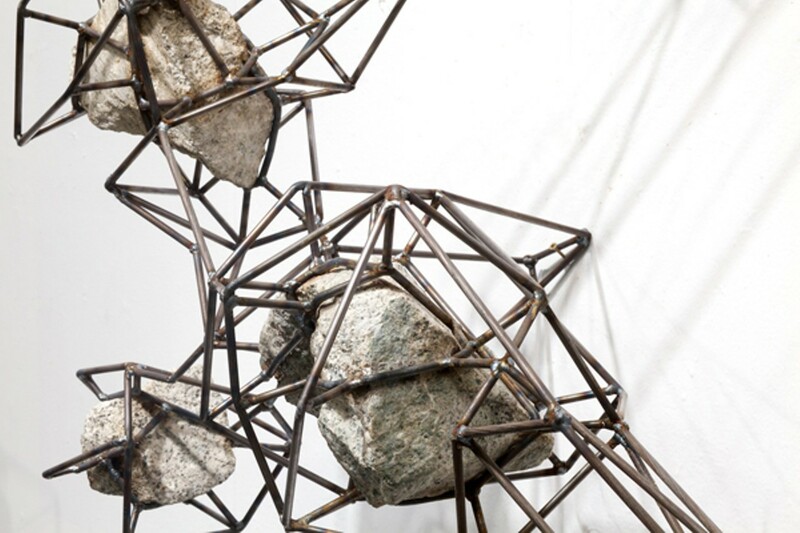 Mark Baugh-Sasaki encaged stones in steel armatures. California's water supply network is very interesting to some people — presumably. The elaborate system of dams, reservoirs, tunnels, aqueducts, and pipelines that corral water from the state's natural rivers and deliver it to our cities is certainly a marvel of hydraulic engineering and, as anyone who has seen Chinatown knows, a politically entangled matter that concerns us all. And yet, the thought of art devoted to such a system, specifically the Hetch Hetchy Aqueduct (which supplies water from the Hetch Hetchy Reservoir to San Francisco and other Bay Area municipalities) in the case of Mark Baugh-Sasaki's current exhibition at Krowswork, is less than thrilling. Visually lusterless photographs of concrete structures in brambly landscapes jump to mind — the imprint of a man on nature: a hackneyed theme. Fortunately, Baugh-Sasaki's The Civilized Wild turns out to be no such thing. To the contrary, the artist presents a provocative, often surreal and in places unsettling array of sculptures and immersive installations that, in their responses to a hydrological lifeline, in fact speak to the phenomenon of "civilization" more broadly — what we've done and where we might be headed. 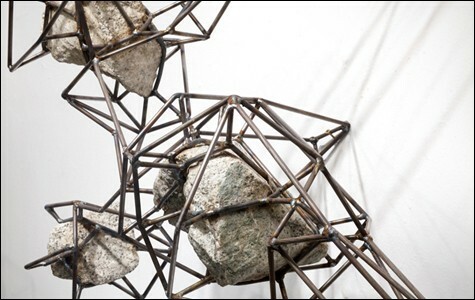 The exhibition takes off with a room full of stones encaged in crystalline steel armatures, welded around the rocks to confine them perfectly in space. While a feeling of imprisonment is absurd (why would a lump of mineral require coercive containment at all, let alone cages as elaborate as these? ), it is palpable nonetheless. In some places the long, bowed steel rods seem to lunge at the rocks, as though struggling to contain them. In an immersive installation nearby, massive, scorched wood splinters hang, cocoon-like, in similar steel vestments. Meanwhile, a wood sluice symbolic of the Hetch Hetchy Aqueduct delivers trickling water onto a plate bearing a frenetic black-and-white video projection, while an unsettling soundtrack of dissonant harp and irregular clanking, by Moroccan artist Omar Mahfoudi, fills the ambient space. The suggestion here is clear: In Baugh-Sasaki's own words, "the transformation of a wild landscape into a domesticated and constructed one is often a violent and traumatic experience." His unsettlingly human-like sculptures, hybrids of the natural and the man-made, are at once the bearers and embodiment of this trauma. In a pitch-dark, quiet room, Baugh-Sasaki produces a contrasting installation as though for respite: five raised, square platforms, each containing gravel and a small pool of water, that video projections from above enliven to give the impression of a rushing, although fragmented, stream. The installation is purposefully tranquil, but at the same time raises some gnawing questions: Why divide up the stream like this, as though for inspection? The artist describes his cutup and reassembled creation as "a Frankenstein of the rivers" — much like the Hetch Hetchy Aqueduct itself. But gallery director Jasmine Moorhead wonders if the gesture isn't more prophetic: "There is viscerally at some level scant difference between watching the video of the stream over rocks and still water, and watching [an actual] stream," she noted. "Is this our post-apocalyptic surrogate?"